One things leads to another in a most interesting way, if you care to think of things that way. Follow me on this, if you can. It all started a week ago, when I fixed up my old beater bicycle so that I could go for rides around Tucson. Yesterday I hopped on that bike and took my first substantial bike ride in many years. Tucson has a very nice multi-use paved trail along the Rillito River, 11 miles in each direction, which I happily rode to the very end. The trail ends abruptly at railroad tracks. I stopped to rest and drink water, while watching the long freight trains scream by. An older man was walking along the tracks with his dog, and we started talking. He’s retired, but volunteers extensively and writes Christian novels. I heard about the time his dog was bitten by a rattlesnake (a distinctive fang scar still on his snout), and the places they walked together. So this morning Emma and I drove over and found the trees. We had never been in a pecan grove before, so it was mostly for the novelty of picking pecans that we went. With Emma on my shoulders, it was easy to pick a partial bag of pecans in fat green husks. We took just enough to have a small batch to eat, since at the time we weren’t sure of the proper procedure for cleaning or roasting them. Pecan husks split nicely along a natural segmentation into quarters. We proudly took our bag home and demonstrated for Eleanor how to husk them. 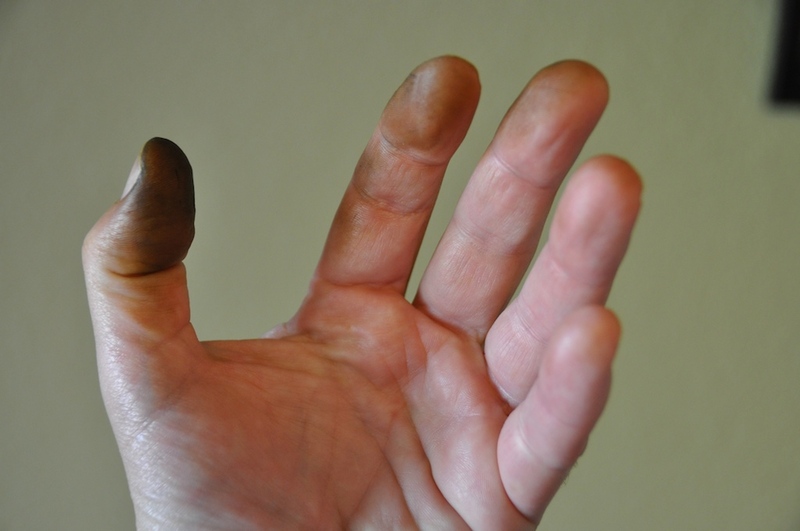 And then we realized something: pecan husks stain your fingers dark brown. Permanently. I have probably the worst-looking fingers in the family because I shucked more pecans than anyone, but all of us have degrees of stained fingers now. Nothing removes the stain because it penetrates the skin, like a henna tattoo. Normally I would find this amusing and nothing more, but it just happens that next week I am scheduled to attend a major RV industry conference. I’m going to shake hands with our current and future clients — or at least, I would if they would want to touch me. I may have to walk around with my hands behind my back, like Prince Charles, although body language experts say this is viewed as untrustworthy. Well, is it better to look like I haven’t washed my hands since I mucked out the stalls? I suppose I could have a t-shirt imprinted that says, “Pecan Farmer.” Or I could look on the bright side of this: now I’m less likely to catch a cold while I’m up in the frozen north on the business trip. Or I could wear gloves and pretend I’m afraid of germs — or just unfathomably fashionable. Apparently abrasive cleaners can have some effect, eventually. So, having fixed up my bicycle last week means that I’ll be scrubbing the skin off my fingers every day this week. And that’s how one thing led to another. Wow!!! Pecan farmers usually pick them up off of the ground while shaking the trees to make them fall off, don’t they? Use some rubber gloves next time. This stain/juice is a natural cure for poison ivy too. You rub the juice on the blisters and it dries them up. Of course the downside is the stain stays and you look terrible. LOL! Try some bleach and/or lemon juice on your hands. It may lighten it a little. Good luck! There is a solution, so I will offer this prescription. First, go to the pharmacy and purchase a pint of hydrogen peroxide 3% ( H2 O2 ), a pumice stone ( room temperature lava ) and a box of bandaids. Next, soak your hand in the peroxide for 20 minutes, then take two ( 2 ) Vicodin tablets. Step three: begin abrading the first three dermal layers with the pumice until the ugly brown stains become a beautiful ruby red color. Finally, dry your hands, wait for the bleeding to stop, then apply band-aids where necessary. That’ll be $35, make an appointment with my nurse on Dec. 4th for a follow-up exam. I used to have five of the biggest pecan trees in Williamson County, TX. I don’t know about NM pecans, but in Texas, we wait until they naturally fall out of the husks before we harvest them. No stain that way. 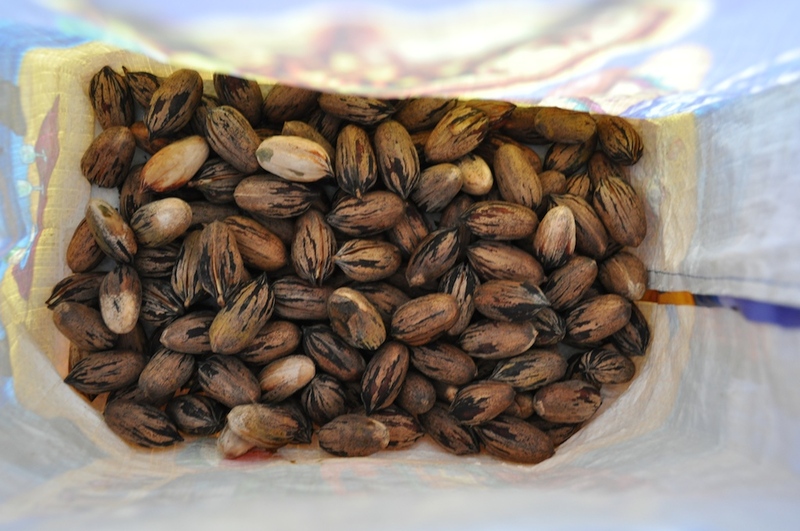 Generally, pecans still in the husk have insect damage. If there were a lot of pecans on the ground in husks, there may have been a storm that knocked them loose before the husks opened naturally. Also, squirrels ted to gnaw them loose and drop them still in the husks. So are YOU the guy who out bid me for Michael Jackson’s glove? We also have a Pecan tree in the back yard and they fall to the ground out of the husks and ready to just pick up. We picked up a five gallon bucket and will bag and give them as gifts for Christmas. There are literally hundreds and hundreds still on the ground. I think if they are still in the green husks the are not quite ready to harvest. now that’s a nice image i’m conjuring up in my head for you to meet new clients. what might they think??? hmmmmm? you could always blame it on the turkey! hope you and E&E have a good one. A few of our pecan trees date from pre-civil war days, so having been in your shoes, I do know something of your situation. Any pecan on the ground, still in its husk, is either damaged by squirrels or knocked down by the wind. Either way, if the pecan is still in its husk, it is not ripe to shuck or eat. Sometime soon, revisit the area and pick up that bucket of mature pecans. You’ll love ’em. I’m with you – the turkey is now gone! !